Our partner program merges the best AV platforms with over ten years of Visionect's electronic paper experience. Cooperation is key to any success story. That's why we have built a network of trusted partners. The biggest AV industry experts set to bringing Joan to every corner of the globe and ensuring a fast and seamless adoption. Leading innovators of the communications, e-commerce, and AI fields band together to create a seamless office experience. A frictionless work experience. Joan now seamlessly connects to existing tools used by millions of office workers every day. Pushing the boundaries of digital displays. 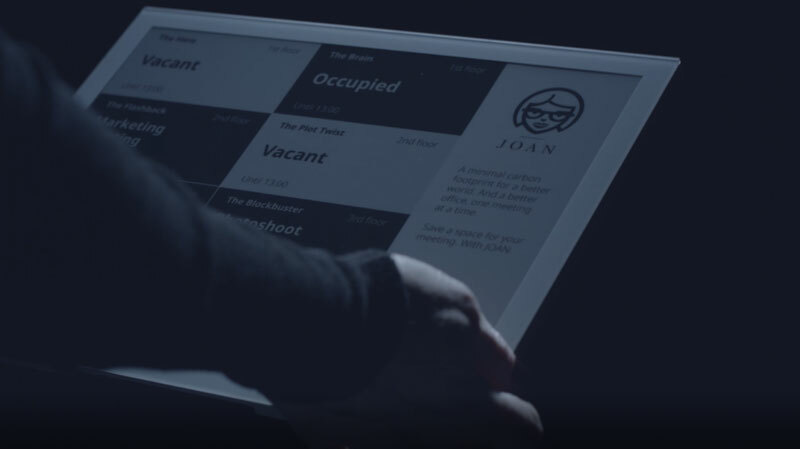 Joan is just one of the many groundbreaking electronic paper products designed by Visionect. Beautiful & effective. Don't just ride the workplace transformation wave. Lead it. 01GrowthAn average of 11 million meetings per day are taking place in the U.S. alone. 02Scale67 countries furnished with Joan. 18.000+ meetings scheduled daily. 03PotentialJoan is the smart answer to the growing number of flexible, remote and mobile working environments. 04VisionAn interactive workplace that drives productivity through frictionless booking and scheduling. The biggest AV experts band together. We're furnishing the office of tomorrow with the tools you're using today. Alexa for Business is now compatible with Joan. Book or release rooms, ask for reservation info and manage your meeting schedule with simple voice commands. Don't interrupt your workflow. Talk to your meeting room the same way you talk to your co-workers. In Cisco Webex Teams. Introduce customers to Joan and become an integral part of the workplace transformation surge.